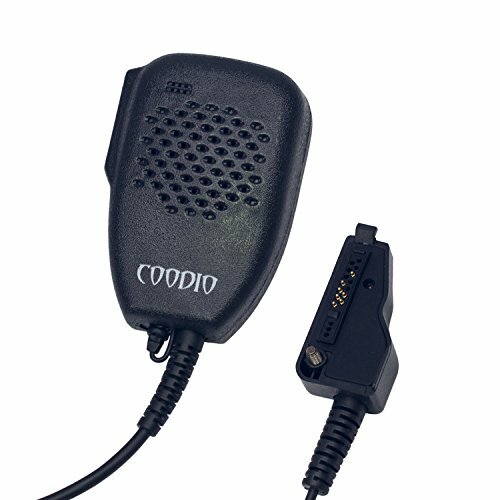 Coodio's multipin Kenwood systems connector two way radio heavy duty remote lapel microphone speaker mic simplifies jobs by allowing users to talk and listen without having to remove their radios from belts or carrying cases. This Remote Microphone conveniently clips to your shirt pocket or lapel and enables easy communication, a large housing makes it easier to operate while wearing gloves in a more rugged environment. Compatible with multipin Kenwood systems connector two way radios including Kenwood Nexedge NX-200, NX-300, NX-200G, NX-300G, NX-210, NX-210G, NX-410, NX-411, NX-5200, NX-5300, NX-5400, Kenwood TK-5210G, TK-5310G, TK-5220, TK-5320, TK-5410, TK-5410D, TK-2140, TK-3140, TK-2180 MPT, TK-3180 MPT, TK-2180, TK-3180, TK-190, TK-290, TK-390, TK-480, TK-481.